Its a clear sunny day and visibility is perfect. 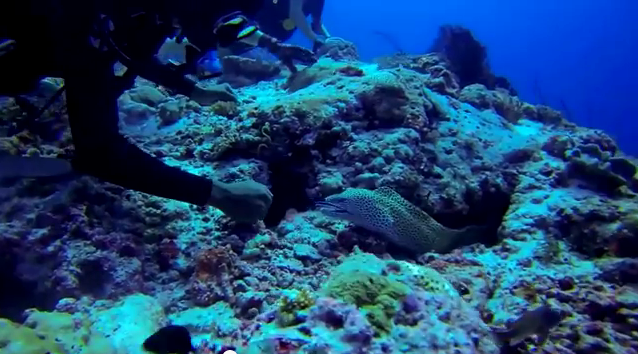 This dive video shows just a normal dive till he cuddles a dangerous moray eel. I was kind of shocked that he actually touched it. You should never touch a moray eel, its a one of the most dangerous creatures you would come across while diving. May be not every time, if you are not highly professional there is a serious risk. Diver touches moray eel in Maldives. See video below. Even for professional divers, if the animal was previously threatened, it could pose threat to your safety. Have respect to moray eels and other living beings so that they may be there for all divers to see up close and personal way you always wanted. No diver would want to see these awesome creatures from a distance.